Research from Zillow reveals the U.S. metros with the biggest increase in collected rent payments in 2014 compared to 2013. While it may be natural for renters to groan every time they make a monthly housing payment to their property manager, what they might not have realized is that they were contributing towards $441 BILLION in total rent paid in 2014. This huge number, provided by Zillow Real Estate Research, reveals that rent payments are indeed getting bigger, but only in some markets. The 4.9% increase in rent payments made since 2013 might be due to the fact that 770,000 new renters entered the market in the past year. Or it might be because certain metros collected 10% more in rent payments compared to 2013. Zillow reports that San Francisco, CA, San Jose, CA, Birmingham, AL, Denver, CO and Pittsburgh, PA all saw significant increase in total rent payments made since the previous year. Renters in San Francisco, CA paid 13.5% more in rent in 2014 than 2013, spending a total of $14.5 billion on rent payments for only 760,000 rent households. Renters in San Jose, CA paid 14.4% more in rent in 2014 than 2013, spending a total of $5.9 billion on rent for only 271,000 rent households. Renters in Birmingham, AL paid 11.9% more in rent in 2014 than 2013, spending a total of $1.03 billion on rent for only 126,000 rent households. Renters in Denver, CO paid 10.8% more in rent in 2014 than 2013, spending a total of $4.9 billion on rent for only 380,000 rent households. Renters in Pittsburgh, PA paid 10.6% more in rent in 2014 than 2013, spending a total of $2.4 billion on rent for 280,000 rent households. While New York, NY remains a big contributor towards total rents paid, with almost $50 billion spent on rent in 2014, this is only a 3.6 percent increase from 2013 ($48.2 billion). Zillow’s research shows that San Jose, CA tops the charts as the most expensive U.S. city to rent in with an average monthly payment of $1,807, making it nearly 30 percent more than New York, NY whose average monthly rent was $1,228 in 2014. Property managers might rejoice hearing that rent prices are rising across the country but a concern arises when one considers the fact that renting is becoming less affordable than buying in some markets. Despite mortgage payments tending to be less than rent payments, most property managers expect the rental market to continue to see growth over the next 12-months, according to a 2014 survey from rent.com. With millennials accounting for a majority of current renters, their student-loan debt and lack of finances for a substantial down payment has property managers feeling confident that they will continue to seek rentals as their preferred housing option. 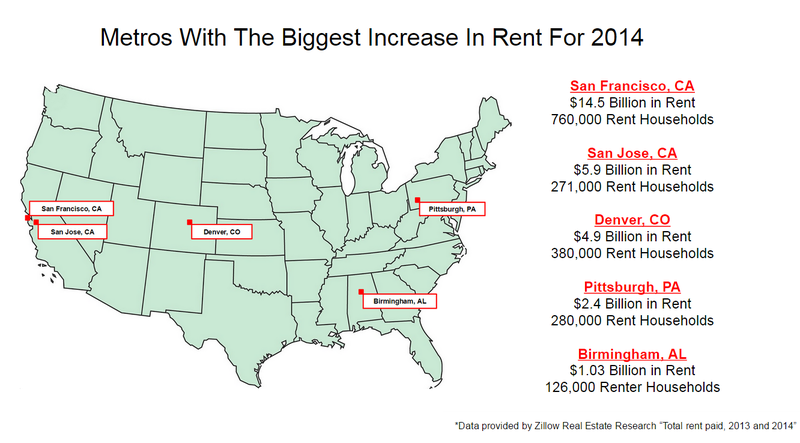 Did you see an increase in rent amounts in your region in 2014? 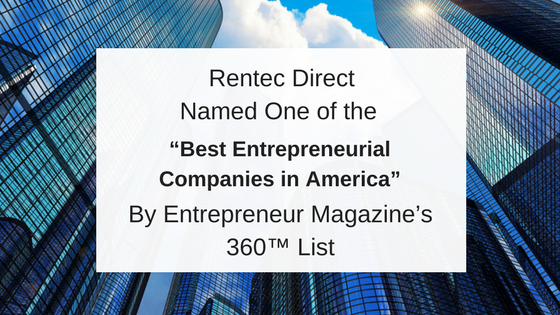 And do you predict the same success for the rental industry for 2015?